Reader Appreciation back and forth! I’m not entirely positive that all writing always has its purpose. More often than not, however, there could be found one. Purpose, that is. Some write for themselves, some don’t think about the audience at all, and some perpetually try to spread their phrases throughout the whole World Wide Web. These are bloggers as I understand it, and it is me as well. I started off assuming that my friends and family (some of which do not even speak English, really…) want and will read what I’m scribbling here, and without any precedence, sent the link out in the open. With some self-imposed success, mind you. That was a year ago, and I couldn’t be more thrilled to see that there are more and more people appreciating my sharings. With that comes such gratefulness and happiness that I’m really excited to announce my very first ever Blog Award (or actually two of them!) coming from lovely Lillian, who scribbles along at High, High, Higher! 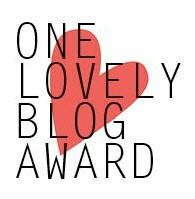 First up is the One Lovely Blog Award. 1. I have been blogging since I was 11, meaning since we got Internet at the family apartment. This is my 5th blog or so, first one in English (I’m Polish and, well, spoke Polish for most of my life). Back then it was so cool and hip, that I aspired to be a graphic designer and do blog layouts. None of those back-in-the-day skills are with me anymore, unfortunately. 2. In 2009, I shaved my previously long, blonde hair off almost for a cause (long story short, I wanted to donate my hair to Locks of Love, but I went a little too far with asymmetrical haircuts and dyes for my hair to be donate-able). I should write about that. 5. As a teenager I chose to pierce my ears over getting my first cellphone. 6. I have read the Harry Potter series (or parts of it) in Polish and Spanish, but not yet in its original version – English. 7. When tagging my posts, I haven’t yet used “backpacking”, even though that’s what I write about. It wasn’t on purpose! It’s just the obvious that is the hardest to realize, it seems. Finding out that I will have a little sister. I was 7. I think the first person I shared this lovely news with was my kindergarden teacher. What is a real fear you have? I kind of don’t like being surprised by spiders. 21 years old ambitious Polish traveler? For now. Of… clothing? Cute. I like cute things! Hipster wannabe (take that with a pint of salt). But mostly comfortable. Or in exams period: first pair of jeans I can lay my hands on and a hoodie. Ooooh! This is an exciting one. Avocado toast! Or cottage cheese with spring onions on fresh bread. Or my grandma’s scrambled eggs. Or granola with yoghurt and berries. Or mangoes. Definitely mangoes. Writing. Reading. Spinning fire. Traveling. Languages. Cooking. Sustainability related stuff. Sometimes swimming. Sometimes yoga. Sometimes hiking. Sometimes biking. What is one of your passions? Changing the world (one more pint of salt, please). But really: sustainable development; and writing. What is the one truth you have learned? That I need to keep learning more. Always. As an extra: if you have not yet heard of the Thought Catalog – go and waste some hilarious hours on their random, but entertaining articles! Thank you so much again, Lillian! This entry was posted in Uncategorized and tagged blog awards, blogging, one lovely blog award, reader appreciation, recommendations, sunshine award, travel blogs by backpackerina. Bookmark the permalink. I make it a point to travel as much as I can, and being from Europe helps – getting to another country is like going from one state to the next. Hope you enjoy reading! I understand the spider thing. I don’t like being surprised by them…or any bug…ever. 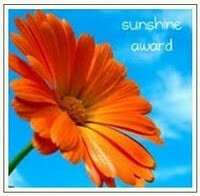 Congrats on your awards! So fun. Ha! I considered that almost rebellious. My dad din’t like piercings, so I ended up getting 5 of them. Ahh stop by Poland when you’re in Europe one day in the future, then! Poi, fire dance, pojki – roznie to zwa, ale chodzi o wymachiwanie lancuszkami ktore maja ogniske kule na koncach ;)! Milego czytania i dziekuje za odwiedziny!